That´s awesome! Now, get the old theme back. There are already enough amateurish-looking sites for duke. at least i finally convinced puritan to take the time to implement fields on the search page to look for mods, TCs, and episodes at CGS. According to MSDN, Duke Nukem 2013 was made by Zykov Eddy, CK Games & Lezing, at least when looking at the hot maps list. 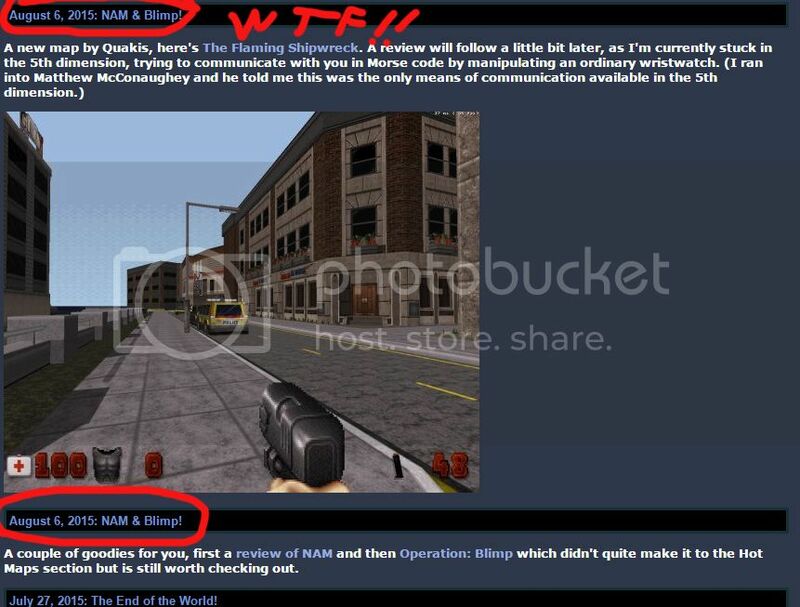 Duke Nukem 2013 =/= Duke Nukem Forever 2013. Hehe whoops. Should have known better I suppose. Wow you wrote an extensive review for Alien: Isolation. Almost makes me want to get the game on retail price. I can tell how much you loved the experience and I imagine enjoying it too (even checked some very short gameplay videos). I wonder how fair is your remark about IGN Reviewer being a scrub, I only overreaded a few lines of his review, but I can tell you may have sometimes difficult to see the hardship on other gamers when dealing with obstacles that are easy for you. In these days of hyper obvious layouts with hundreds of game hints and radars with mission objectives, you can´t call all gamers ADHDrs. Hell, i by no mean want to defend that online journalist, but I was just wondering if maybe the game is actually too difficult for people like me. I wonder how fair is your remark about IGN Reviewer being a scrub, I only overreaded a few lines of his review, but I can tell you may have sometimes difficult to see the hardship on other gamers when dealing with obstacles that are easy for you. In these days of hyper obvious layouts with hundreds of game hints and radars with mission objectives, you can´t call all gamers ADHDrs. Hell, i by no mean want to defend that online journalist, but I was just wondering if maybe the game is actually too difficult for people like me. Ok, but here's the thing: if the reviewer weren't a scrub, he wouldn't hold the difficulty level against the game. Only if the difficulty level were unfair would he have a legitimate reason to criticize the game rather than himself. There are many critically acclaimed games that are very hard; it's just that they're hard in a way that's fair. So is Alien. It means the Xenomorph can get you anywhere at any time, giving you no opportunity to avoid death, and run you down if it hears so much as a pin drop. Which simply isn't true. The reviewer is wrong about facts. You hide in a locker, storage cabinet, or under a desk, stare at your motion tracker until the creature completely leaves the area, and then you proceed as quietly as possible toward your next objective. I’d be curious to know how many of its roughly 15-20 hours I spent hiding in lockers, staring at the motion tracker, and, most of all, how many hundreds (yes, hundreds) of times I died without a chance to save myself. It seems that he spent all that time without learning anything. You don't go into those lockers/closets. You don't stare at the motion tracker (it beeps and attracts the alien). You take a quick look at it when the alien is far away. I have no idea how good you would be at this game. It'd be interesting to find out. From what I can tell, gunplay is your weakness but it's not a factor in this game at all. This game is about patience, improvisation and conservation. August 6, 2015: NAM & Blimp! Ah, yeah I sometimes forget to change the news title since I simply copypaste the previous news headline. Looks like his prophetic nature of the Simpsons doesn't carry over to the Duke community itself. Another site - still quite young - Alejandro Glavic's site is currently posting some good stuff. My prophetic visions of a dark future were correct but I chose to change it. Hah, I'd definitely like to see that. These days I tend to think of you as mapping the kind of things you come across in real life, at least when it comes to exteriors. Thanks for your review for my map Spacetronic, Mikko!